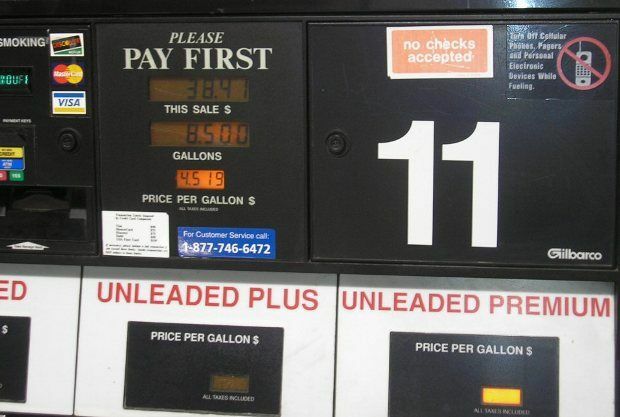 Drivers were paying $4.50 to $4.70 a gallon during October 2012, and now prices are nearly a dollar lower. A year ago this week, Southern Californians were paying the highest prices ever for gasoline - $4.70 on average. Today, prices are nearly a dollar lower in most areas as they continue dropping for the third straight week, according to the Automobile Club of Southern California's Weekend Gas Watch. The state average is $3.828 a gallon for regular today – 6.3 cents lower than last week. The average price of self-serve regular gasoline in the Los Angeles-Long Beach area is $3.842 per gallon, which is 6.6 cents less than last week, 10 cents lower than last month, and 86 cents lower than last year. In San Diego, the average price is $3.838, which is 6.2 cents below last week, 8 cents below last month, and 88 cents lower than last year. On the Central Coast, the average price is $3.92, down 6.1 cents from last week, 5 cents lower than a month ago, and 76 cents less than last year. In the Inland Empire, the average per-gallon price is $3.811, down 6.7 cents from last week, 8 cents lower than last month, and 87 cents less than last year.